Alistair Elias, C.Ss.R., 32, was ordained a deacon on October 6 in Boston, MA. Originally from the Caribbean nation of Grenada, Alistair is completing his theology studies at Boston College’s School of Theology and Ministry. He professed first vows as a Redemptorist in 2008, and final vows in 2011. The eleventh of 12 children, Alistair was born in the village of Gouyave Estate in Grenada, and grew up in Dougladston where his grandmother lived. There are no Redemptorist missions in Grenada, so Alistair first met them in high school when a friend invited him to meet a Redemptorist who was visiting the island. At the time, Alistair had never considered being a priest, and didn’t know much about the life. He finished high school and became a teacher. But he soon stumbled again upon the Redemptorists while surfing the Internet. “What got me was the motto, ‘working with the poor and most abandoned,’” Alistair said. 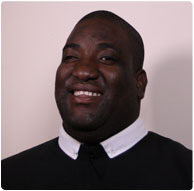 “So when I started thinking of becoming a priest, I could not help but think about the Redemptorist brother I’d met, and about that motto.” With the help of the Sisters of the Sorrowful Mother, a community of Franciscan sisters who work in Grenada, Alistair was helped along on his vocational journey. He credits many people with encouraging his vocation, including his grandmother, and an elderly woman he met while on pilgrimage to the Shrine of Our Lady of Fatima in Grenada. Alistair encourages those discerning a vocation to try it out because it can help a person discover his or her true self and God-given gifts and talents. Thank you for your prayers for Alistair as he begins his ministry as a transitional deacon. Please also remember in your prayers another Redemptorist, Elton Letang, who is scheduled to be ordained a deacon later this month in Trinidad. Both men anticipate ordination to the priesthood in 2013.